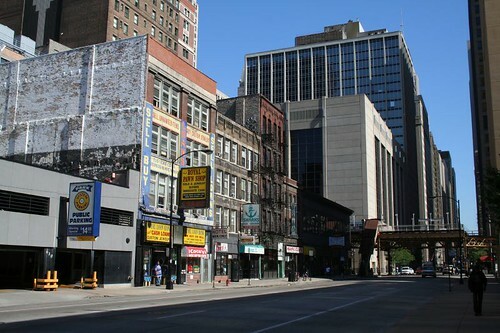 In a downtown that has heavily sanitized itself in the last 20 years, the 400 block of S. Clark Street is one of the last really seedy-looking places left. 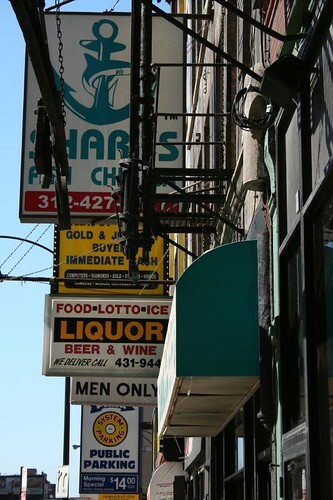 This little run of 4 turn-of-the-century buildings is home to such fine establishments as the Royal Pawn Shop, the Ewing Annex Hotel (MEN ONLY), a nameless liquor store, Sports Tap & Grill, Shark’s Fish & Chicken, and Coco’s Deep Fried Lobster. None of the buildings look like they’ve been significantly altered since Truman was president, and their businesses are the sort which tend to dangle at the economic rope’s tail end. The buildings are grimy, still coated with the layers of smoke and soot which were common in cities before World War II. They’re likely the same way inside — shabby, untouched, dark, grungy. It gives them an aura of age, a presence which, in the eyes of my generation, translates to that rarest and most precious of qualities: authenticity. We can look at such buildings and realize that so much of the city once looked like this, that this is a small window into America’s urban past. People my age can look and romanticize it, and moan when the inevitable condo conversion occurs — we never had to live like this. 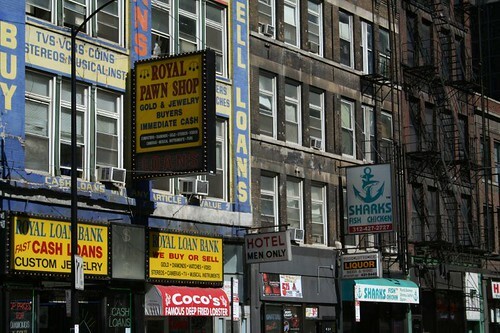 As is often the case with low-end businesses, heavy signage is equated with prosperity. Every surfaces is painted or bedecked with brightly colored signs in plastic and vinyl. The foreboding presence of the Chicago Metropolitan Correctional Center (a high-rise, concrete, triangular-shaped jail) across the street is likely a big reason the block remains as it is, and even that may not last. Already the rising tide of economic fortune is lapping at this block’s shores — right next door, a 5th vintage building has been converted to a nightclub. To the south, and across the street, massive parking garages have replaced whatever contemporary neighbors the buildings once had. It’s a fair bet that within a few years, the march of lofts and condos will find its way here, too. How many years NOW before you reckon demand will erase this streetscape? Given the vast overstock of new condo construction that has since glutted the South Loop and the overall economic landscape, I expect that this "window to the past" will continue well beyond the foreseeable future. If you want sanitized, go to Minneapolis. I was pining for a wig shop or tire store.